VATICAN CITY (CNS) — St. Joseph, patron saint of the universal church and Jesus’ earthly father, was a “dreamer capable of accepting the task” entrusted to him by God, Pope Francis said. 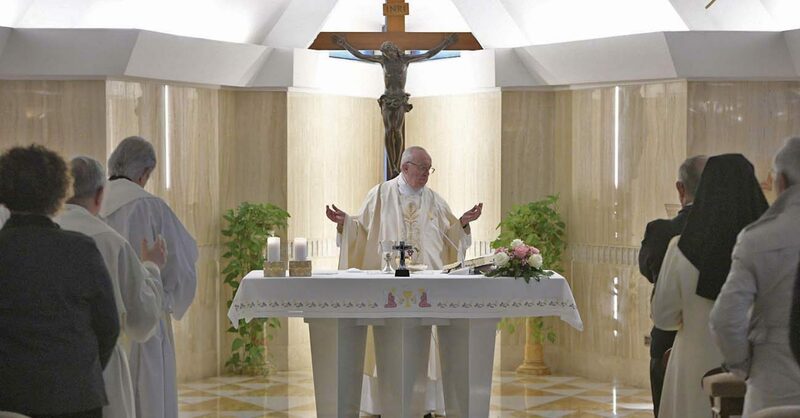 “This man takes God’s promise and brings it forward in silence with strength; he brings it forward so that whatever God wants is fulfilled,” the pope said March 20 during morning Mass at Domus Sanctae Marthae. Because the March 19 feast of St. Joseph fell on a Sunday this year, the liturgical commemoration of the feast was moved to March 20. By marrying Mary, Joseph ensures that Jesus is born of the House of David and provides him with an earthly father and with a stable family. The biblical St. Joseph is “a man who doesn’t speak but obeys, a man of tenderness, a man capable of fulfilling his promises so that they become solid, secure,” he said. Christians, especially young people, should follow the example of St. Joseph who was not afraid to listen to his dreams like when he was told in a dream not to be afraid to take Mary as his wife and again when he was told to flee with Mary and Jesus to Egypt. When “we dream great things, beautiful things, we draw close to God’s dream, the things that God dreams for us,” the pope said. “May he give young people — because he, too, was young — the ability to dream, to risk and to take on difficult tasks that they have seen in their dreams,” Pope Francis said. The pope also spoke about the feast during his Sunday Angelus address March 19, which is celebrated as Fathers’ Day in Italy. Pope Francis led the crowds in St. Peter’s Square in applauding fathers everyone. Pope Francis told the crowd about the beatification March 18 of Blessed Josef Mayr-Nusser, an Italian layman and father who was sentenced to death for refusing to swear an oath of allegiance to Adolf Hitler. He died of dysentery on the way to the Dachau concentration camp Feb. 24, 1945. Like St. Joseph, Blessed Mayr-Nusser is a “model for the lay faithful, especially for fathers, who we remember with great affection today,” the pope said. Before reciting the Angelus prayer, Pope Francis reflected on the Sunday Gospel reading in which Jesus speaks to the Samaritan woman at the well. The “tiring and tedious work” of drawing water from a well, the pope explained, mirrored the Samaritan woman’s fruitless efforts to quench her thirst “for affection and a full life” by having had five husbands. “Perhaps we are going in search of ‘wells’ whose waters do not quench us. When we forget the true water, we go in search of wells that do not have clean water,” the pope said.